The building that houses the Museum in Docklands, No. 1 Warehouse, is over 200 years old and was used as a sugar warehouse. It has undergone excellent renovation work and was opened on June 10, 2003, by the Queen. Many original features remain, including much of the timber flooring, which is even older than the building. 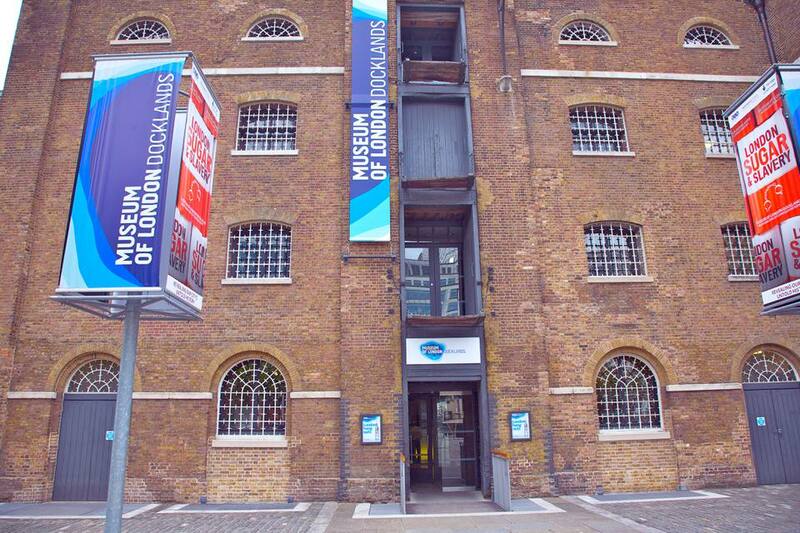 Since 1 April 2010, the Museum of London Docklands is FREE entry for all, and open seven days a week. The Docklands Light Railway (DLR) trains give amazing panoramic views of the Docklands area of London and do not have a driver so children can sit at the front and pretend to drive the train! Use London's Journey Planner to plan your route to the Museum of London Docklands by public transport. From West India Quay DLR station, the Museum entrance is a five-minute walk. Turn right and walk with the water on your left. There are old warehouses, converted into bars and restaurants, on your right and new buildings across the water. You will pass the footbridge to Canary Wharf on your left. The Museum of London Docklands is at the end of the pool basin on your right. The Museum of London Docklands explores the story of London's river, port, and people, from Roman settlement of the port, through to the recent regeneration of London's former Docklands. 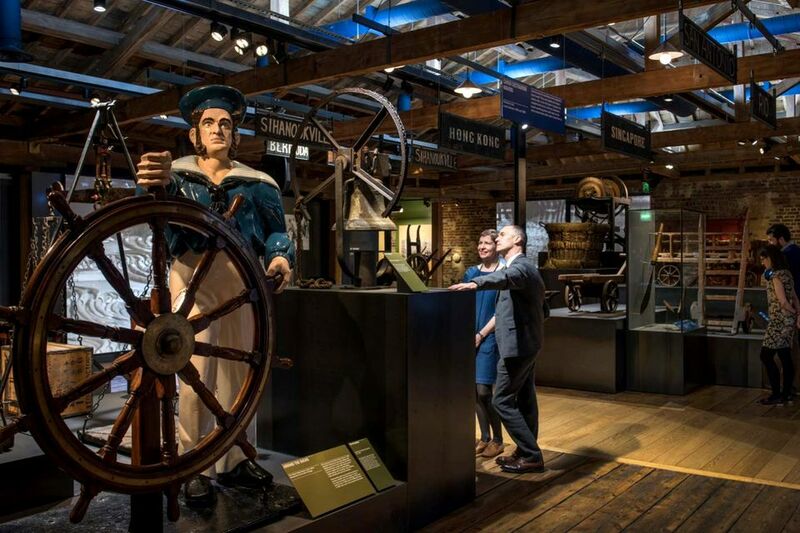 Take a journey through London's history with a guided tour of the Museum of London Docklands, every Wednesday and Saturday from 3 p.m. to 4 p.m. The Gibbet: after public execution, pirates were hung on a wooden gibbet and in an iron cage! Dock Cooperage (barrel-maker): Listen to the East London accent on the video! Small cinema room in the Docklands at War gallery that brings the subject to life. This exhibition also has an area for quiet contemplation, as it can be upsetting to see what happens during wartime. Sailortown: A full-sized reconstruction of the streets of the riverside Wapping district of East London in the 1840s. It's dark, and there are side alleys for people to hide in. It's scary, but also good fun. Included in this dodgy area of London are a wild animal emporium, an alehouse, and the sailors' lodging house, which gives you insight into the life of a sailor. City and River: Lookout here for Rituals & Races and see the famous Doggett's Coat, dated 1833. Did you know that for a short time in 1821, London was the largest whaling port in the world? See the huge whaling pot from the early 19th century, used to render blubber to oil also in City and River. Information about the sale of London Bridge to an American developer for £1,025,000. U.S. customs officials identified the bridge as "a large antique!" The Museum of London Docklands has a lot for children to do. Every Saturday and school holiday the Museum holds free family events, many of which link into themes studied at school so you can learn about London's history together. It's always smart to call ahead and see what's going on when you want to visit. Kid's Activity Packs are available for free on the third floor. These are small backpacks full of activities for different age groups. These are free to use and there are usually plenty available but they are offered on a first come, first served basis. A favorite area for kids under 12 is Mudlarks. This is an informative and interactive play area on the ground floor that features a special soft play section for kids under five. Everything is themed around life in the London docks, so big kids can weigh cargo or load a tea clipper while little ones get to crawl around with large foam bananas and a London bus, plus they can pretend to drive a DLR train. Weekdays during school term: 2 p.m. to 6 p.m. Weekends and school holidays: 10 a.m. to 6 p.m.
You need an invitation from the front desk to enter Mudlarks, but there is no extra charge, and you can go back as many times as the kids want to throughout your visit. Still, to prevent overcrowding, time in Mudlarks may be subject to certain restrictions.